The Director General of State Company for Travelers and Delegates Transportation Mr. Abdulah Lu’aibi has ordered to activate the public transportation lines between Bismayah New City and Baghdad. Iraqi Minister of Planning Mr. Salman Al-Jumaili met the South Korean Minister of Infrastructure and Transportation Mr. Kim Keung Hwan, where they have discussed multi issues regarding the economical, technical and investment aspects and how to develop and reinforce it. 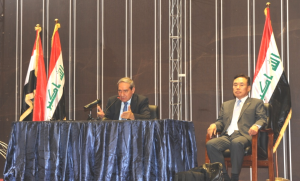 Iraqi Minister of Planning stressed on the deep relation between Korea and Iraq, adding that Iraqi people trust and respect all Koreans’ endeavors to support Iraq. His Excellency clarified that the last years witnessed a great collaboration between Korea and Iraq in terms of human resources development and through Basic Cooperation Agreement signed between Iraq and Korea International Cooperation Agency (KOICA). 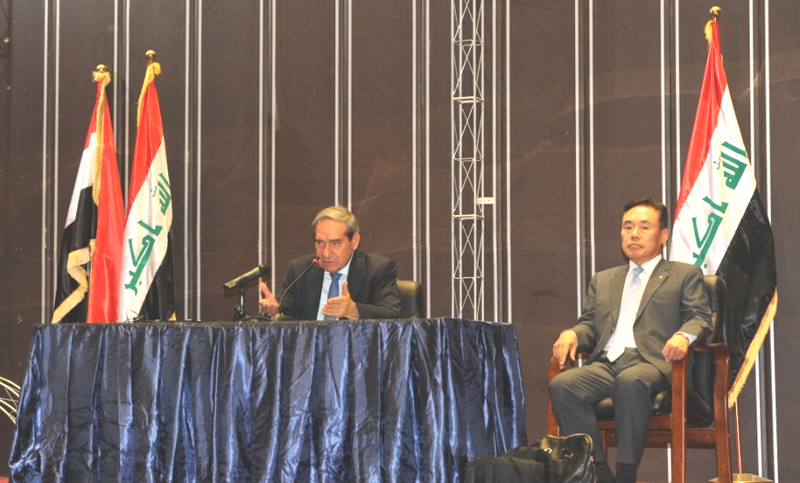 Al-Jumaili invited the Korean Companies to participate in the reconstruction process for the released provinces through implementing huge projects, adding that Iraqi Government has prepared a reconstruction plan that consists of two parts; the first one aims to restore the stability and life to those destroyed areas through providing the basic livable services ( 1 Month ~ 1 Year), while the second part will reconstruct the full basic infrastructures as well as improve the economic and social situations. This plan considered a good opportunity for the Korean’s to be an active part of it; especially regarding the construction of underground infrastructure like water, sewage and roads networks. The two Ministers discussed the possibility to arrange different cooperation agreement between Korea and Iraq; one of them related to the technical cooperation which is intends to be signed within the first quarter of this year. Ministry of Education has opened four new schools at Bismayah Housing City in coordination with Baghdad Governorate Council, in line with the preparation to construct more schools in the complex. Ministry of Housing and Construction confirmed that the construction Bismayah New City Project is being implemented according to high global specifications. The Director General of Public Relation Department in the Ministry of Education Mr.Ibrahim Sabti stated to Al-Sabah Newspaper that MOED opened four new schools in BNCP in coordination with Baghdad Governorate Council and Al-Russafa Education Directorate. He clarified that the three new schools are Ur Primary Schools for Girls, Ashur Primary Schools for Boys, Al-Waha Al-Khadhra’ Secondary Schools for Girls and Al-Asr Al-Jadeed Secondary School for Boys. He considered the opening of such schools as successful step that encourages the construction of integrated housing complex. On other hand, Miss Nisreen Hadi who works as member in the education committee of Baghdad Governorate Council stated that they are working on the preparation of another lands to increase the construction scope of new schools buildings in Bismayah New City, and the legal procedures are ongoing to make those lands ready for construction. Those schools will be supplied with sophisticated equipment and tools that create proper and convenient environment for the students. In this regard, Ministry of Housing and Construction has confirmed that National Center for Engineering Consultancy staffs are visiting the field of work continuously to follow up the situation of progress. In line with the rapid progress that Bismayah Housing Project has been achieved regarding the construction workflow, and especially after the distribution of the first delivery part of apartments to registered people. Other specialists have proposed to establish other housing cities similar to Bismayah and to be connected with Baghdad city through highways in order to facilitate the transportation process for inhabitants. Until now Bismayah New City Project is the biggest development project and first of its kind in Iraq. It would be able to accommodate 100,000 units. Many specialists were stressed on the significant to adopt such investment projects nearby Baghdad City as in Al-Rasheed Camp area. Mr. Zidan the real estate specialist has praised the National Invest Commission efforts to create an integrated system in Bismayah New City which includes electricity, water treatment plant, sewage treatment plant, roads networks, public facilities, educational facilities and commercial facilities. He confirmed that the creation of such convenient environment will encourage Iraqi citizen to inhabit the vertical housing complexes, the thing which would resolve housing crisis as a result. What is left to achieve the full success for the entire project of Bismayah is to be connected with highway, railway or tram, in addition to allocating central terminal and buses for inhabitants’ transportation inside the housing complexes as in Europe. The Buildings Directorate continuing the work as one of the mOCH formations in Bismayah New City Ptoject, this project considered the hugest and most stratigic one in Iraq and Middle-East. It contains 100,000 housing units for more than 600,000 persons, in addition to adopting the highest global technologies regarding the construction techniques. Bismayah New City Project is being implemented by the Korean Company " Hanwha", which is one of the pioneer Companies in the field. It consist of three type in terms of area 100m2, 120m2 and 140m2 spread on 8 towns and provided with full service scope like electricity, pure water, sewage treatment system, communications network, parking areas, schools, kindergartens, clinics and police stations. On other hand, Building Directrate is providing all possibile experiences regarding the engineering supervision on the implementation of project. Our engineering staff is auditing all works according to the technical adopted specifications as well as materials through performing the labs testing. On Sunday the Iraqi Prime Minister Dr. Haider Al-Ibadi has met a delegation the Korean Company “Hanwha”, which is implementing the Bismayah Housing Project south-east of Baghdad Province. The PM office has announced a statement which included “Prime Minister Al-Ibadi stressed during this meeting on the necessity of developing the marketing activities for the housing units and to establish an Urban Management Company to ensure the successful management for the services of the city, in addition to providing the other success requirements for the project like maintenance and securing the financial rights of the Company. His Excellency expressed his appreciation for the current accomplishment achieved in the project as well as the Company’s Commitment. The delegation made a presentation on the level of achievement made in the project, and clarifications about the project’s costs with the outstanding payments. The delegation confirmed that the first delivery part which consist of 3,000 housing units have been completed fully with the best standards. NIC Chairman, Dr. Sami Al. Araji asserted, on Sunday October.18.2015, continuing the work wheel in Bismayah housing project according to the previously laid down timetable, adding that the work rhythm is rising to deliver the first patch of the housing units at the end of this year, denying delivering any unserviced unit. Al. Araji submitted a detailed explanation about the first stages of the project saying that 72 thousand people registered their names in the preliminary registration process conducted through the internet to reserve housing units in Bismayah, while 30 thousand units where reserved by the banks which counts more than the 100 thousand units planned to be constructed. according to the story above the contract was signed and people were invited to attend and sign their units contracts after paying the down payment, but what happened was not all the preliminary registrars came, the matter that compelled the NIC to obtain the Ministers Council approval to take loans of 2 Billion $ from the Iraqi banks with 4% profit in order to ensure the first payment that covers 25% of the total project value according to the mechanism approved by the Ministers Council in the year 2010. NIC chairman added that Hanawah Co. invested this money in constructing 14 factories, which are considered the skeleton of the whole project, in addition to the infrastructure and the buildings being currently constructed. Dr. Sami also confirmed during the meeting that essential services of water supply, sewage, power supply and gas will be ready with delivering the first patch of the housing units, while work is moving forward to deliver the needed schools, hospitals and other services for the ready compounds. Guests, in their turn, showed their comfort and appreciation for the efforts of the company and NIC to commit to all their obligations according to the timings agreed upon, hoping that delivering the first patch and getting registrars settled will be a good start in the way of having the rest of the city completed. Parliament member Dr. Humam Hamoudi asked on Wednesday to accelerate the construction of Bismayah which is implemented by the Korean Company “Hanwha”. Hamoudi stressed as well to encourage the people to buy housing units according to the big difference achieved in the project, in addition to exploit the empty spaces to construct similar housing complexes which can participate in housing crisis reducing. Humam Hamoudi Office stated that “The parliament member Humam Hamoudi visited Bismayah Housing Project accompanied with members from the integrity and economic committees, in addition to the NIC Chairman Dr.Sami Al-A’raji to follow up the workflow”. “Hamoudi” confirmed the necessity to make Iraqi ministries participate in the units buying, especially the establishment of martyrs. This would be through allocation of housing units to those people. He clarified “We’ve found a very significant and bright point in this project which is PC Plants complex, it is one of the hugest plants in the world as well as it represents an investment opportunity for the next projects in future”. Hamoudi pointed out to the need for transportation arrangement to access this city. This would encourage people to buy more units especially with the accomplishment of come housing blocks. The executive Company of Bismayah Housing project started the construction of the second housing buildings type (Modern Type). NIC mentioned in an official statement yesterday that the construction flow is going in accelerated pace reaching up to the seventh floor, Pointing out that the modern type has been designed similar to the traditional style in terms of area and the buildings’ outer shape, but this new type is dedicated to families who prefer a modern housing, which provides an ideal exploitation of area where the living room interfere with the kitchen in one layout. Each building is made up of ten floors, in addition to the difference in windows outer frames and internal partition between the rooms which represents the main difference between the first models and the second. On the other hand NIC was announced recently that it will make an electronic lottery in the second half of this year, to distribute the first delivery part of housing units in Bismayah Project to the registered people. Manager of sale center Mr. Ali Adnan Al-Ramahi stated to the Iraqi National Agency that the NIC will held an electronic lottery in the second half of this year in order to ensure the equity in the units’ distribution between registrars, adding that this lottery will be held in public in presence of the registered people. NIC Chairman Dr. Sami Al-A’raji confirmed yesterday that any housing unit hasn’t been handed over without full services in Bismayah Housing Project yet. Al-A’raji said during a meeting held with members of Bismayah friend’s forum that “NIC is keen to make Bismayah housing project an ideal city; in terms of the modern architecture and services which will be presented to the inhabitants. He pointed out that NIC prepared two plans regarding the city’s services matter; the first plan related with the whole project in line with the work progress schedule when the units be delivered annually as per to the contract conditions made with the executive Company “Hanwha”. The second plan was prepared to feed the basic services to 7,000 housing units which will be delivered at the end of current year, whereas the electricity, pure water, sewage, LPG, the construction of several schools and clinics will be available exceptionally to this coming delivery part. On the other hand, Al-A’raji instructed to hold a monthly meeting with this forum to brief the registered about the latest developments and to answer on all inquiries, in addition to arrange a monthly visits to the registered people and those who has the desire to book units in the site. Hanwha Engineering & Construction Copr. All right reserved.